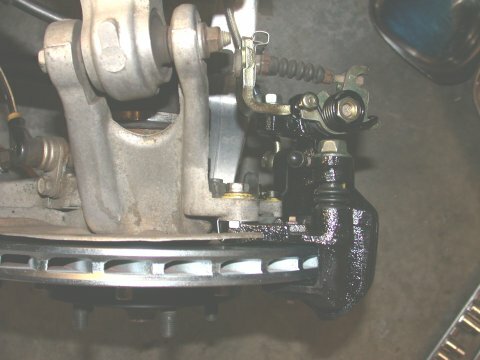 1999 Mazda rear calipers with Precision Brake 2 piece rear rotors Have you installed bigger front brakes? Probably need to install bigger rear brakes as well. Installing just "bigger" front brakes will certainly help with reliability and fade resistance on the track but it doesn't do the brake bias any good at all. In fact, it is possible with the upset brake bias, braking distances will be longer than the original setup using the smaller brakes! Although one will argue that at the threshold of brake lockup the ABS system takes over making lockup of one end of the car over the other not really and issue. But brake bias also has a big effect on how the car handles when braking just under the lockup threshold. 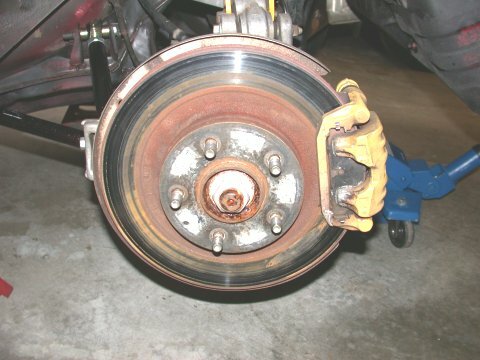 So there is the primary issue of realigning the brake bias by upgrading the rear brakes. There is also the issue of reliability and fade - same as with the fronts. Bigger rotors with more mass and better cooling are more capable of dissappating heat and thereby reducing fade and the propensity for rotor cracking. Recently, at a track notorious for being hard on brakes, I cracked both left and right rear *slotted* rotors in two places each. I've cracked rear rotors before but not slotted rotors and not in two places! Time for some upgraded rear brakes. 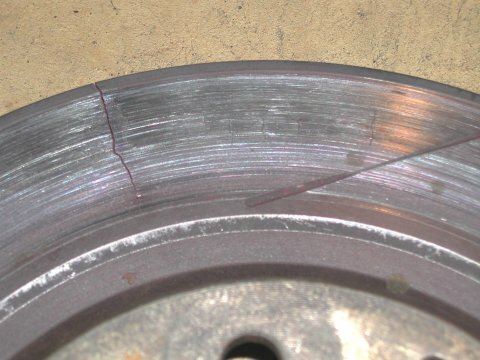 A cracked rear slotted rotor. Two cracks in each rotor! CHOOSING THE RIGHT KIT The need for more robust rear brakes is unquestionable when speeds increase and stickier tires are used but what do you upgrade the rear brakes with? There simply is virtually nothing available to upgrade too. 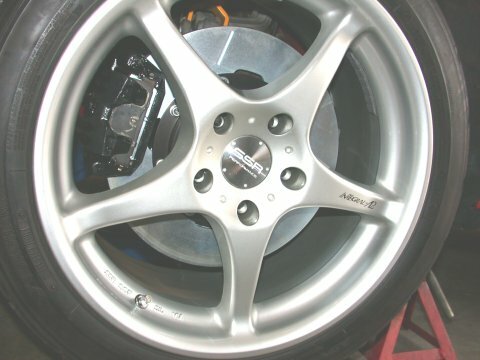 Mazda, however, was kind enough to recognize the need for bigger brakes on the 1999 RX-7 so for the RS and RZ models designed a slightly larger rear setup. 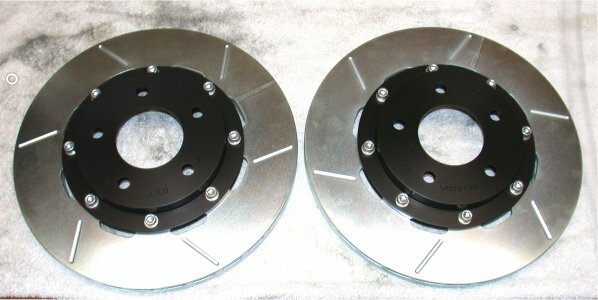 The RS/RZ rear rotors are 12.36" X .79" up from 11.57" X .79" for the '93-'95 models. Lucky for us. 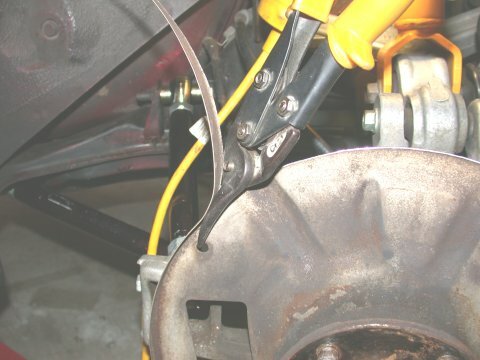 Some custom made brackets for Wilwood calipers have been developed but are neigh on unobtainble these days not to mention the fact that this modification eliminates the parking brake. This would make daily driving burdonsome for a multipurpose car such as mine. Pure track car..maybe ok. My car... not really an option. So the 1999 RS/RZ Mazda brakes it is. 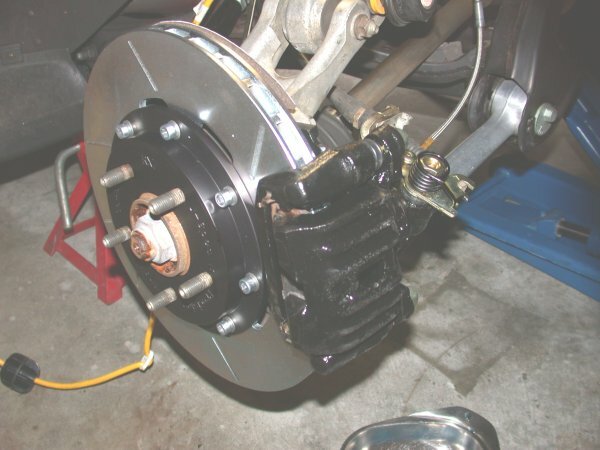 To be specific the only difference between the 1999 RS/RZ rear brakes and the 1993-1995 rear brakes is in the dimensions of the rotor, namely the diameter and the offset of the caliper. 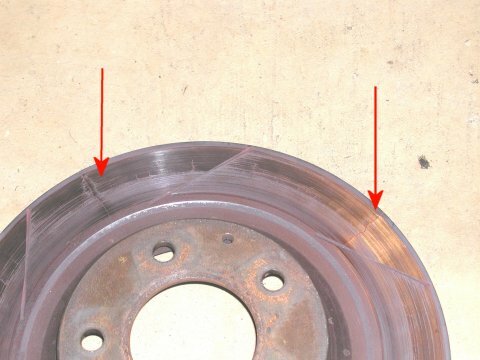 The rotors are the same thickness and use the same caliper design principle. Note the difference between an '93-'95 rotor and the dimensions of a '99 RS/RZ rotor. 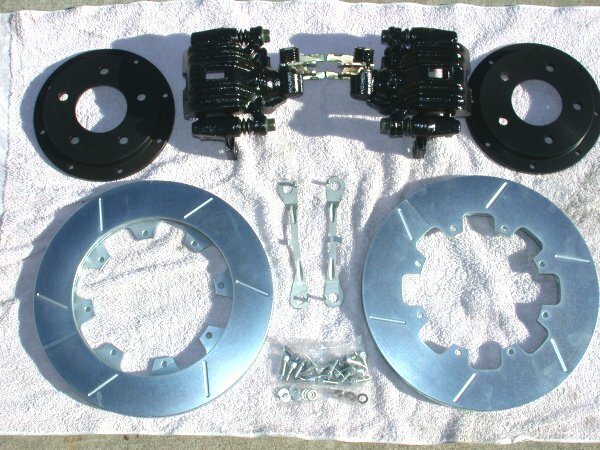 PRECISION BRAKES TWO PIECE REAR ROTORS Precision Brake 2 piece rear rotors assembled Lets talk about the rotors in my "kit." 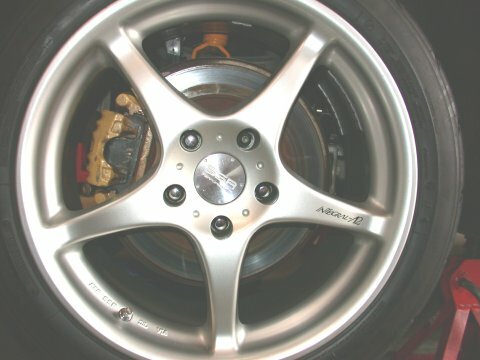 The 1999 RS/RZ factory rotors are a one piece unit. 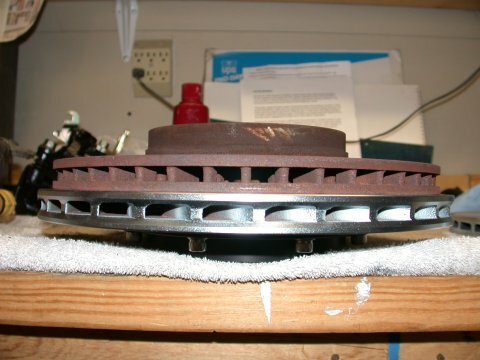 Over the course of late 2002 and 2003 a two piece rotor was developed by Precision Brakes Company. 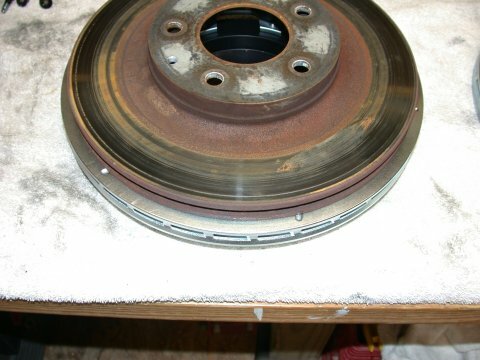 Dimensionally the two piece rotors are identical to the one peice Mazda rotors. However the two peice units use anodized aluminum hats (I chose black to match my front AP brakes) and the rotor section uses curved vanes vs. straight vanes for more efficient cooling. So the two piece units are both lighter and at the same time cool better without the sacrifice of reduced thermal mass. The only shortcoming at this point is in the bolting mechanism. The Precision brake rotors use a simple allen bolt with a threadlocking compound threaded into the rotor itself where a throughbolt design using a bolt and locknut would have been preferred. Then there is the queston of cost. To some inital cost might seem too steep, the two piece units being about $40 more per rotor than the one piece Mazda rotors. However, when come replacement time the rotors for the two piece units are cheaper **AND** more easily sourced - the '99 rotors must be imported from Japan. 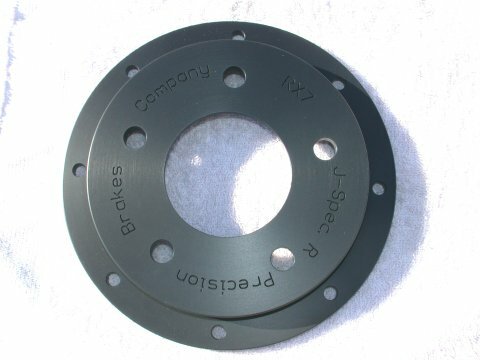 Precison Brakes aluminum hat - love the "Type-R" text? If you still have the brake rotor screws in place, remove them - an impact driver works wonders. Slide out the parking brake cable retainer spring and disconnect the parking brake cable. 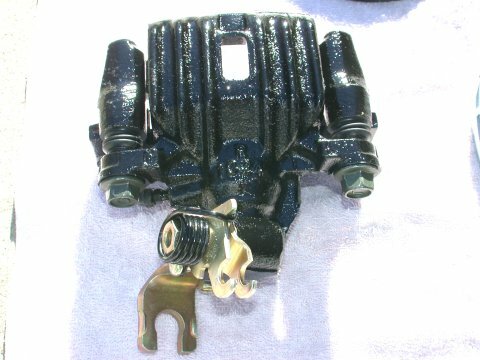 Remove the brake pads by loosening the top caliper bolt and removing lower caliper bolt. 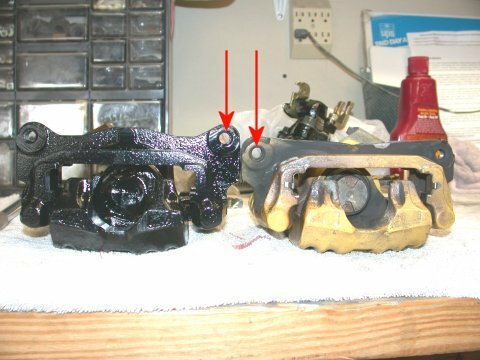 Swing caliper up and drop out the pads. Loosen caliper to hub bolts but don't remove just yet. Ok now remove the caliper mounting bolts and remove the caliper. The less time the brake line is disconnected the better. With tin snips trim the lip off the splash shield if you still have one. Install the '99 rotor assembly making sure the direction of rotation is correct. Looking at the top of the rotor: slots pointing forward, vanes angled rearward. 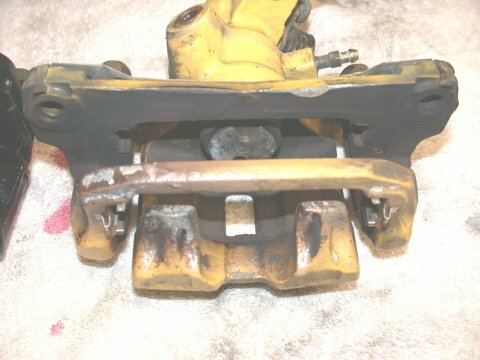 Before installing '99 RS/RZ caliper transfer the brake pad retailer springs. Bolt on the '99 caliper remembering to use the new shim. Reconnect the brake line using new copper washers. Reinstall brake pads and parking brake cable in reverse order of removal (love descriptions in the FSM like this don't ya?). Snip flange off splash shield to clear bigger rotor. BEHOLD THE FINISHED PRODUCT The finished installation. Note slots point forward and vanes point rearward when looking at the top of the rotor. Before and after - gone are the Bling Bling yellow calipers. Low key and stealthy brakes now.